When the wave of revolutions known as the Arab Spring reaches Syria, Bassel is a successful Internet entrepreneur. He works for international companies, makes lots of money, and parties deep into the night with friends from the Syrian art and film worlds. But when a BBC reporter asks him to make videos of the Syrian rebellion and smuggle them out of the country, life changes dramatically for Bassel. He directs an army of volunteers armed only with their cell phones who record the Syrian revolution and spread the news via social media. Bassel secretly enjoys his resistance work. He forms friendships for life, parties like there’s no tomorrow, and meets the woman of his dreams. But the battle toughens. Friends flee, are arrested or get killed. Remarkably, for a long time, Bassel himself escapes unscathed. His friends begin to wonder: Who’s protecting him? Then, on March 15, 2012—coinciding with the first anniversary of the Syrian Revolution—Bassel’s luck runs out. He’s arrested and tortured. He remains imprisoned to this day. Author Monique Doppert – Programme Officer for Alternative and Independent Media in West Asia at Hivos – followed Bassel closely for more than three years. 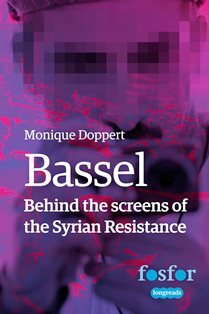 Her story, Bassel: Behind the Screens of the Syrian Resistance, provides an alarming look behind the scenes of the Syrian Revolution. Meet the man who showed the world what’s happening in Syria.